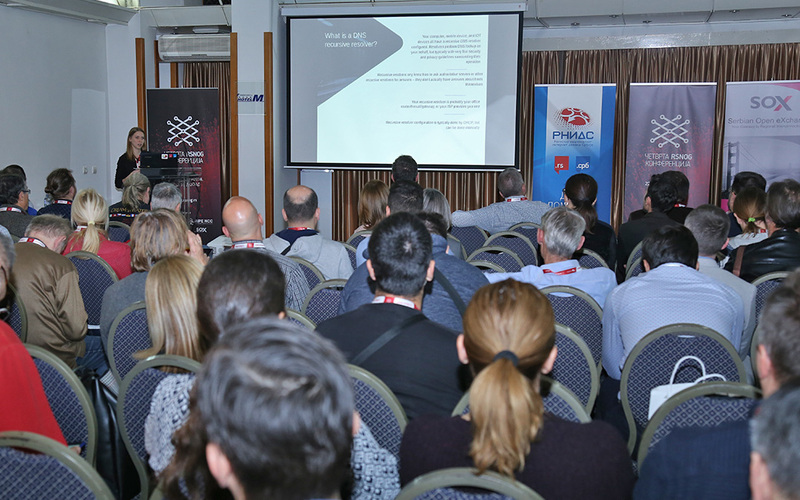 The fourth RSNOG conference was held in Hotel “M” in Belgrade on November 22, with the support of the Foundation “National Internet Domain Register of Serbia” (RNIDS), RIPE NCC, Serbian Open Exchange (SOX) and Cisco. This conference gathered over 150 network experts from the largest domestic telecommunication companies, cable operators, the Internet and hosting providers (Telenor Srbija, Telekom Srbija, SBB, Post Office Serbia, Serbian Open Exchange, Radius Vektor, Elektroprivreda Srbije), domestic IT companies (Pupin Telecom , Unicom Telecom, Telekom Srbija, Madnet), academic institutions (Faculty of Electrical Engineering, Belgrade, Faculty of Computer Science) and state institutions (Office for Information Technologies and Electronic Administration, Ministry of Trade, Tourism and Telecommunications Director, Ministry of Defense and the Army of Serbia, Ministry of Education, Science and Technological Development, the RTA). The conference was additionally followed by several hundred interested parties via livestream. The talks were about the tools that RIPE NCC offers to network administrators, on RIPE Atlas newspapers, and visibility and analysis of content in IP networks. The importance of introducing changes and increasing the significance of clowns when security on the Internet is concerned, the importance of the IPv6 protocol and the NAT64Check Version 2 tools, DNSSEC and the digital signature of .RS and .СРБ domains, as well as the DNS anycast platform Quad9. Like last year, the RSNOG conference generated an increased interest in the RSNOG mailing lists. All presentations, lectures and photos from the Fourth RSNOG Conference can be found on the website of the RSNOG community.